The new Nikon D850 is a 45.7 megapixel full-frame DSLR camera that uses a back-side illuminated (BSI) sensor with no optical low-pass filter. The D850 offers continuous shooting at 7 frames per second at full resolution with full AF performance, or an even faster 9fps with the optional MB-D18 Multi Battery Power Pack and EN-EL18b battery. Other key features include an ISO range of 64–25600 (extendable from 32 to 102400), the same 153-point AF system as the flagship D5 with 99 cross-type sensors and a dedicated AF processor, 4K UHD video recording, 8K timelapse movies, slow motion movies up to 120 FPS at 1080p, a tilting LCD touchscreen, Nikon's highest magnification optical viewfinder ever (0.75x), silent photography in Live View mode, 1,840 shot battery life, Bluetooth Low Energy connectivity and support for UHS-II SD and XQD cards. 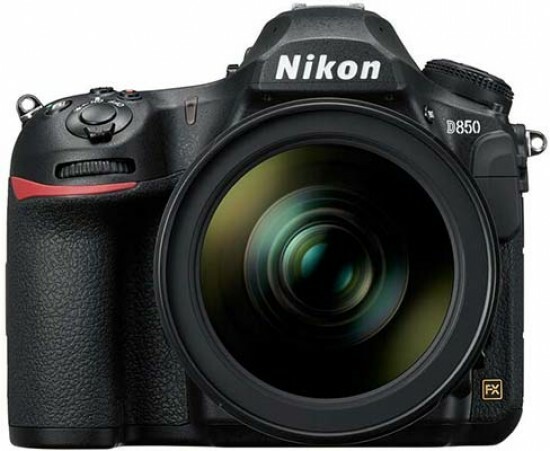 The Nikon D850 is priced at £3,499.99 / €3,899.00 / $3299.95 body only. The Nikon D850 is the successor to the popular D810 camera, and outwardly the Nikon D850 looks very similar to its predecessor. It features a redesigned, even deeper and narrower hand-grip, while the overall shape of the camera body has near identical dimensions. Weighing in at 915 grams the D850 is ever so slightly heavier than the D810, once again feeling reassuringly hefty in your hand. The control layout is broadly similar to that of the Nikon D810, which is a good thing in our book - but there are some key differences. As well as the new handgrip, there's a brand new Fn2 button on the rear-left of the camera, the LCD screen can be tilted up and down, there's a very handy thumb-operated joystick for selecting the AF point, and the ISO and Mode buttons on top of the camera have swapped positions. Around the shutter release is a switch for turning the camera on or off, and if you move it around on further than the “on” position, you'll also switch on the illumination light for the LCD panel which is useful when you're working in lower light conditions, just like on the D5 and D500 cameras. The D810's pop-up flash has also been completely removed, with the microphone holes now on top of the camera. That's about it for the visual differences between the new D850 and the older D810, so upgraders will feel quickly at home with the latest iteration. The small textured joystick on the rear of the D850 allows you to select an AF point. You can also use it as an AE Lock button. It's an intuitive little joystick to use, and as it falls neatly under your thumb when holding the camera it's very quick to change the point you need. You'd have to give the joystick a reasonably hard push by accident to change a point when you didn't want to - and hold it down to move the point across further than one point. You also have the option to use an eight way controller just underneath the joystick to set your focus point, but it's pretty small and not that comfortable to use. For the Nikon D850 there is another way to set the autofocus point - but only if you're shooting in Live View. You can now use the screen as it is touch sensitive. Simply switch the camera to shooting in Live View (there's a dedicated button near the screen) and you can tap on screen where you want the point to be. While it's true that the majority of photographers will be using the viewfinder to compose, using the screen is useful in certain applications, such as when shooting macro subjects. Autofocusing is designed to work in conditions as dark as -4EV for the central AF point and -3EV for the more sensitive cross-type sensors. This gives you great scope to work in a variety of lighting conditions, and the Nikon D850 really delivers well, locking onto subjects in dark conditions quickly and easily without hunting around - news and reportage photographers who are working with natural low light at nighttime should really appreciate this. In terms of low light there's a definite and noticeable improvement from the previous D810 model. The focus mode switch on the front of the D850 has two positions only, AF and M. Cycling through the available options (single, 9-, 21- and 51-point dynamic, 3D tracking, auto area and group area) is done in a similar vein as on the D5 and D7200. To wit, the focus mode switch has a small button at its hub. You can toggle between AF-S and AF-C modes by holding down this button, with the switch in the ‘AF' position, and turning the rear control wheel. To cycle through the available AF Area modes, use the sub command dial instead. 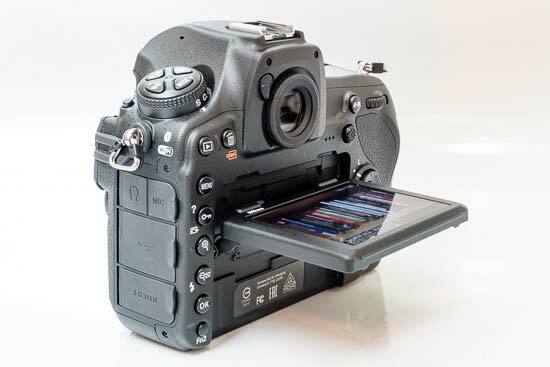 The settings are displayed in the viewfinder and the top-mounted status LCD. New to the D850 is the Pinpoint AF Live View mode which allows you to put the tiny focus point literally anywhere within the frame. The Live View button on the rear is encircled by a two-way Live View mode selector. This lever can be set to either “live view photography” or “movie live view”, each of which is denoted by a little, self-explanatory icon. The Live View implementation features only a single Live View mode where the mirror is locked up, and AF is performed using the contrast detection method. Upon entering Live View, the mirror is raised and the lens is stopped down to the working aperture, allowing for an accurate depth of field preview. 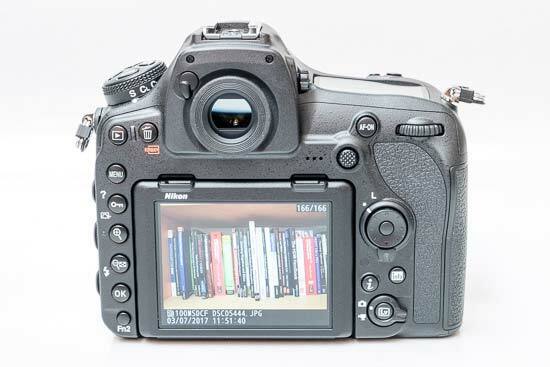 As with other Live View enabled Nikon DSLRs, there is a red rectangle that you can position anywhere within the frame, so you can focus precisely on the part of your subject that you want to appear sharpest in the resulting photo. Live View auto focus speeds aren't stellar, particularly if compared to the latest generation of compact system cameras, but are decent for a DSLR. The D850 does now feature a completely silent Live View option - turn on the Silent Photography in Live View option and you can capture without sound or mechanical vibration. In Mode 1, you can shoot for up to 6fps continuous at 45.7 megapixels. In Mode 2, you can shoot 8.6-megapixel pictures in DX image area at 30fps for up to 3 seconds. Furthermore, the silent electronic shutter can also be employed when shooting a time-lapse, which helps to keep the image sharp and reduce wear and tear on the mechanical shutter. As far as manual focusing is concerned, you can magnify into the live view feed up to 23x - but it's worth noting that this magnified view is at least partially interpolated, which is a bit of a shame. Also there is a live histogram - though in order to actually see it you'll need to remember to push the OK button first to enable the Nikon D850's Exposure Preview feature. Architectural photographers will be glad to hear that the optional virtual horizon is a dual-axis version showing both pitch and roll. The Live View split-screen zoom displays magnified areas of the left and right sides of the live view frame, making more precise adjustments even easier than the virtual horizon. “Movie live view” enables you to accurately preview framing for videos, which have an aspect ratio of 16:9 rather than 3:2. There's now a wealth of movie shooting options available for the Nikon D850. There's not only 1080p (full HD) at a variety of frame rates (24p, 25p, 50p, 60p) along with some crop modes, but there is now 4K video recording for as long as 29 minutes 59 seconds, with no cropping of the sensor. Furthermore, you can shoot for more than three hours using the MB-D18 Multi-Power Battery Pack! The D850 also has an electronic Vibration Reduction system that reduces the impact of camera shake during movie recording, although this only works when recording 1080p, not 4K footage. Manual exposure adjustment is available for movies - note that ISO and shutter speed are only adjustable in 'M' mode, while the aperture can be set in both 'A' and 'M' modes. The Nikon D850 features a built-in microphone but for professional-grade audio recording you'll definitely want to use an external one. In order to monitor the audio during movie capture, you can also connect a pair of headphones to the camera. As is now the norm for virtually every digital camera, from compacts to CSCs to DSLRs, there's a dedicated red movie-record button on the D850, located right next to the shutter release. We found this button a bit too small for our taste - your mileage may of course vary. The depth-of-field preview button found on the front panel of the camera can be used to add indices to specific frames during recording so that they are easier to locate in the editing phase. At the heart of the Nikon D850's live view and movie live view experience is a tilting 3.2” LCD screen, rather than the fixed screen on the D810. It's also seen a bump in resolution - there's now 2359k dots, whereas the D810 had 1299K. The touch sensitivity isn't available for every facet of camera option, but it is a very usable extra. You can use it to set the autofocus point and even take the picture in Live View, but perhaps more appealing to professional photographers is the option to swipe through images and pinch to zoom - it makes checking that you've got the vital shot just that little bit quicker. Unlike the D5, you can also use the screen to select menu options. The optical viewfinder, which is one of the most important parts of any SLR, is big and bright with 0.75x magnification and approximately 100% frame coverage. Like the D5, the Nikon D850 comes with a Type B BriteView Clear Matte Mark VIII focusing screen. The excellent on-demand viewfinder grid display (Custom Setting d6) has been carried over from the older model. When using the optical viewfinder - as opposed to shooting in Live View mode - you can take advantage of the Nikon D850's outstanding 153-point AF system, which includes 99 cross-type points which are more sensitive. Similarly to the D5, the D850 features an upgraded version of the venerable Multi-CAM 3500FX auto focus module, which boasts improved sensitivity (down to -4EV) and support for lens-teleconverter combinations as slow as f/8. In use, we found the system to be highly capable, even in low-light situations. Under normal light levels and with the right lens mounted, the speed of the auto focus system is blazingly fast, meaning you can capture even the fastest-moving subjects with ease. 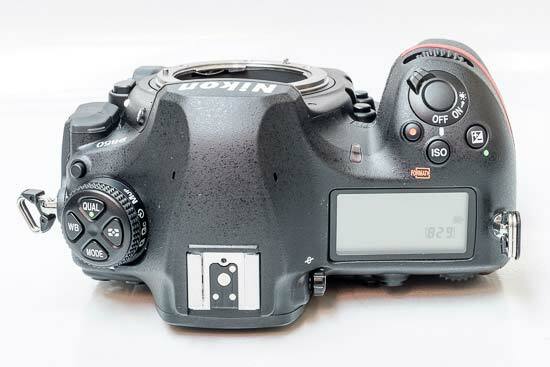 The Nikon D800/E's physical metering mode selector has been retained in the D850, located on the release mode dial. However, the meter itself features the very same 91,000-pixel RGB metering sensor as the D800/E. Aside from being very sensitive - down to -1EV in 3D Colour Matrix III and centre-weighted modes - the sensor also assists the camera in tracking subjects, detecting faces (when not using live view) and focusing. The 'highlight-weighted' metering option promises to preserve highlight detail in especially contrast, backlit scenes. Unlike its predecessor, the Nikon D850 no longer features a pop-up flash. 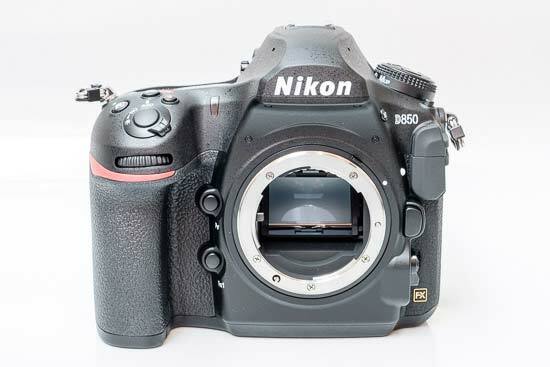 The D850 has a standard Nikon hot-shoe and an ISO 519 compliant Prontor-Compur flash sync terminal for connecting cable-contact flash units such as studio strobes. The PC sync socket is protected by a rubber flap, as is the proprietary 10-pin connector that sits directly below it. The latter is used to attach an optional wired remote release or GPS unit to the camera. The D850 has a user configurable Exposure Delay Mode - you can set the length of delay between mirror up and image capture (1, 2 or 3 seconds). Although the camera has a proper mirror lock-up mode too, the Exposure Delay Mode comes in very handy whenever you don't have a remote cord to hand. Auto ISO sensitivity control works the same in the new model. You can have the camera determine the minimum shutter speed based on the focal length of the lens in use. This means that the camera may raise the ISO sensitivity if the shutter speed drops below 1/200 second when using a 200mm lens but leave it unchanged down to 1/50 second if a 50mm lens is attached (this can be fine-tuned by the user). Usefully Auto ISO is also available in the manual exposure mode. The Nikon D850 offers a maximum continuous shooting speed of 7fps in FX mode, which is a step forward from the 5fps of the D810. Considering the amount of data that needs to be moved during a quick burst, this shooting speed is nothing short of phenomenal. There's an even faster 9fps available with the optional MB-D18 Multi Battery Power Pack and EN-EL18b battery fitted. As with the D5, you can choose to shoot in "Raw M" (25.6MP) and or “Raw S” (11.4MP) to produce a smaller files than the full resolution gives which can extend your continuous shooting even further and make it easier (in other words, quicker) to transfer images. What hasn't changed is the rather clumsy way of storing and retrieving combinations of frequently used settings. 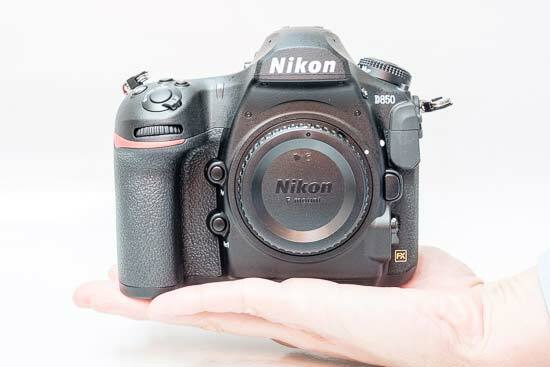 The Nikon D850 has separate Shooting Menu Banks and Custom Settings Banks, and even if you use both you still cannot store all of your settings, much less activate them at the same time. This is rather strange as even the more enthusiast-focused Nikon D7100 has two easy-to-access user settings, labelled U1 and U2. While we are aware that many photographers don't use memory banks / user settings at all on their cameras, we would still love to see this fixed in a future firmware update. The Nikon D850 has dual SD and XQD memory card slots. The implementation of the two-card system is exemplary: you can tell the camera to record every image simultaneously on both cards for instant backup, designate one card to store raw files and the other JPEGs, use the secondary card for “overflow” - you name it. The camera is compatible with XQD and UHS-II compliant SDHC and SDXC memory cards. On the left hand flank, if viewing the camera from the back, we find three commendably firm, hinged rubber doors that stay open until you close them. Sheltered behind these is a pretty extensive array of connection ports including a mini HDMI connector, a USB 3.0 port, as well as both microphone and headphone jacks. The Nikon D850 also features an Ethernet port and is compatible with the WT-7 wireless transmitter. Note that in order to use the mini HDMI port you'll have to buy a separately sold Type C HDMI cable, as none is included with the camera. The Nikon D850 draws power from a new proprietary EN-EL15a battery which is CIPA rated for an incredible 1840 shots. Those that need even more power and/or want to speed up their continuous shooting should seriously consider the optional MB-D18 Multi Battery Power Pack and EN-EL18b battery.